This is a fun and useful little book! Carter goes through the basics of numerology. There are clearly delineated methods for extracting the personal Life Path, Karma, and Destiny numbers from the birth date and name. The numbers 1 through 9 are thoroughly described for their inherent traits as life numbers. Each number’s description includes a section on how people influenced by that number behave in relationships, tips on rearing a child born under that number, and a list of strengths and weaknesses. In Chapter 6: The Master Life Paths, the numbers 11 and 22 are scrutinized in detail. These are challenging life or destiny numbers, thus can yield much greater achievements or much more difficult problems. The final chapters offer discussions of some oddball but relevant topics not normally seen in numerology books. Carter discusses the meaning of repeated digits (i.e., 333, etc. ), number patterns, the 23 enigma, the 11:11 phenomenon, and the Law of 5. There’s a lot of information packed into this 84-page book. 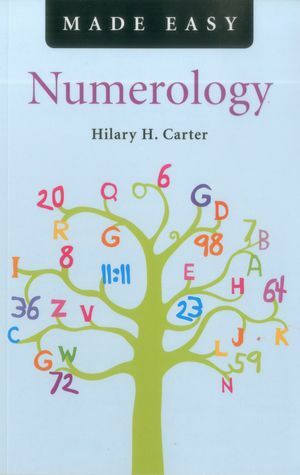 It can serve as an accessible introduction for numerology beginners or a worthy new viewpoint for numerology experts. The writing is clear and succinct, but also warm and personal. Recommended.